Ok, moving on, rapidly! So now that I have sewed myself into feeling better with the Renfrew tees and a little vintage number for Daughter no 2 I feel ready to tackle another pattern from Pattern Magic. I still wanted to play with the “Just Like a Stole” style. So out came the paper and rolls of Magic Tape (I still need to get shares in Scotch-tape). 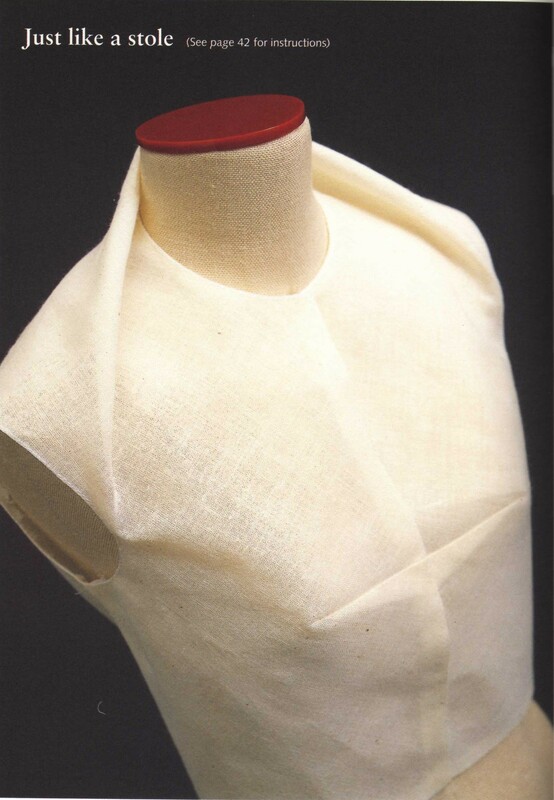 The book has a high neckline which will never work on me, so I have adjusted it to be a sort of rounded v. I also have a front button fastening, and sleeves. Not too fancy this time, just pleated 3/4 length. The dart has been moved, and elaborated! See the sketches.. Again, the trickiest thing with the pattern is making a Winnie block do what another writer needs. It works though! Although I’d love to share the photos of the pattern and toile with you, dearest husband has filched the camera. The difference between fashion illustration sketches, and reality! This is a sketch of the blouse I am making, the sketch on the left is done using a template from this book from Morplan, and the next one was done over a photo of moi. What a difference proportions make! You can get similar sketches from Fashionary, free downloadable templates, or buy the sketchbooks. Oh how I love little gems – nice spotting at the thrift shop … I wonder what will become of it from your stash when the time is right. I love the 3 dart modification you made. It adds that *extra something special* that sewing gives you that RTW doesn’t.